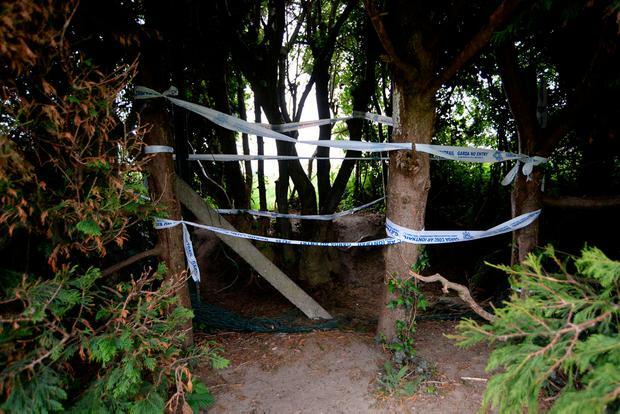 General view of the entrance to the field where the body of Cameron Reilly was found in Dunleer, Co. Louth. The murder of teenager Cameron Reilly forced the community "to focus on the face of evil and be repelled by it", a priest has said. One month on from the brutal killing of the 18-year-old, further calls have been made for information and co-operation with the Garda investigation. The body of Mr Reilly, who had been assaulted and then strangled, was found in a field in Dunleer, Co Louth, by a man walking his dog. At the Mass in St Brigid's Church, Dunleer, Fr Michael Murtagh said: "We still feel the shock and pain of his death and the manner of his death. "Our community has been shaken to its foundations by the violence that led to Cameron's death." A large crowd attended the Mass. In his homily, Fr Murtagh repeated the Garda appeal. It was also reported at the weekend that intimidation by drug dealers with dissident republican links is preventing people with crucial information from coming forward. The priest also acknowledged the huge outpouring of "extraordinary goodness and good-will that has been directed our way and we are convinced that darkness and violence and malice will not have the last say". Speaking to the victim's family and friends, Fr Murtagh said: "We hope this month's mind can be even a small stepping-stone to healing. "We are very aware of the scale of your loss and of your intense grief and the frustration that you and all of us feel while the investigation proceeds. There are still a lot of difficult days ahead of you and ahead of all of us." Gardaí last week arrested an 18-year-old man as part of their investigation. He was released without charge and a file is being prepared for the DPP.